Take Control of the Chaos. If you’ve struggled to find a routine for your home that works, there is relief to be found. Here’s the problem…you haven’t been creating a routine for YOU. You’ve tried routines that work for other people…someone else’s schedule or list of cleaning – when that’s just not realistic. Everyone has different needs. You’ve got to create a routine for YOU. This e-course is set up into 8 simple, easy-to-follow lessons designed to give you the tools and resources you need to be able to make a realistic and workable routine that fits YOUR family – not Susie Soandso down the street. Create a realistic routine for your family – based on your needs. Overcome laundry overwhelm with a simple plan of attack. Tackle your paperwork clutter and get rid of the piles. Make the best and most efficient use of your time each time you leave your home. Enjoy a clean, organized kitchen and employ an arsenal of tips to feed your family well. Develop a cleaning routine that will help you maintain a neat and tidy space. Build in purposeful time to get ahead and prepare for busier seasons. Simply put, by the end of this course, you’ll have a plan in place to take control of the chaos in your home. BONUS: If you work outside the home, this course is for you, too! 7 of the 8 lessons include a short bonus video dedicated to strategies specifically for those ladies who work outside the home. Once you sign up, you will be able to log in and access all eight (8) of the lessons. They are all available to you to go through as often as you want, with lifetime access. Note: If you sign up for Level Two, you’ll also receive 30 days-worth of daily content and all the freebies in your email inbox. At the beginning of each lesson will be a list of basic resources/tools you’ll need. We keep everything simple because if it isn’t easy, you won’t do it! Once you build a strong foundation, you can grow at your pace and develop what works for YOU. Each of the lessons includes approximately 15-20 minutes of video content and a short, printable outline if you want to take notes. I know you’re busy, so there’s no super-long list of videos to try and cram in your busy schedule. We’re all about TAKING ACTION. Once you watch the video content, I give you a list of resources mentioned in the videos which, when possible, are links so you can easily find everything. At your own pace, work through what you learn in the lessons and then, when you’re ready, move on to the next lesson. If you have questions before you buy, or as you’re going through the lessons, you can contact me directly for assistance. I want to be your biggest cheerleader. Put on your superhero cape, lady. Let’s do this. Develop a plan to take control of the chaos that’s your home. I have been trying to find a system that would work for me. My schedule is not your normal Monday through Friday schedule. Our weekends are not always Saturday and Sunday. This course gave me the tools to set myself up with a routine that worked for me and my family. The tips and resources Stacy gives you are for everyone! If you are at home all day, she’s got tools and tips for you. If you work outside the home, don’t worry! She’s got videos and tips for you too! I work only 2 weeks out of the month and this course greatly helped me! This isn’t your typical “wake up at the crack of dawn” kind of course either. I am by no means a morning person, and I’ve tried to be! If you’ve been hunting and haven’t found a way that works, try this out! I really really enjoyed your course. It lit a fire under my tush and prompted me to revamp my weekly schedule for the better. More specifically, the way you stressed getting children to help convicted me. I need to do this with my weekly schedule more. I need to teach my children more cleaning chores. You gave me practical ways as well as encouragement for including them. I will admit a lot of this course overlaps with the book you’ve recommended and I love, “Large Family Logistics.” But for someone who learns better via video vs. reading, this course will speak to them much more. You make it fun. You’re funny. I laughed so many times. Anyone who watches/follows you on periscope and loves it there, is going to adore this. I finished going through all the videos today and I simply wanted to send you a note to let you know how much I enjoyed them! I’ve already set up our schedule and I made today kitchen day. I’ve gotten several things made and I’ve been cleaning up as I go which has greatly helped! Thanks for putting together a toolbox with methods that can work for just about anyone. Your presentation is excellent. You were on task and deliver was very clear. Very entertaining along with great information. I’ve been a fairly routine person, but it was very helpful to think through my own routines and how they are working for me. I haven’t been able to implement everything yet, because I’m still trying to work through how this all fits for me and my family. I have implemented the one load of laundry everyday. I am trying to figure out what the order of my days should be as far as cleaning, kitchen, office day, etc. Your course is helping me more than I can express. You simplified it for me so I don’t feel all anxiety and hard on myself. I am taking it one step at a time and I am ok with that. I have struggled with homemaking forever since I didn’t have any example of how it is done growing up. I have read books, watched youtube and on and on with my efforts only making me feel overwhelmed and full of guilt. With your course, I am FINALLY getting it. A dark cloud is lifting off of me! Thank you for all that you do, truly!! I expect my business to grow because of it too. I am an *ahem* experienced homemaker, yet I often felt as if I was not on top of caring for my home and family. My husband’s weekend days are Tuesday and Wednesday, and we homeschool our daughter. We struggled to make a schedule that worked well. (To be honest, I struggled. My husband is more of a go-with-the-flow kind of guy.) Enter this course. Stacy helped me think about how I could organize my days so that I could better enjoy my days. As a family budget maps out our intentional plan for our finances, removing worry and empowering us to be good stewards, this course helped us plan our days so that we have an intentional plan for our days. The knowledge that everything will be handled in its time is empowering. When the unexpected happens, and it does, we pick up where we are and relax. I love the videos and the resources. Thanks, Stacy, for creating such a great course! This is a value of almost $60 JUST in freebies (plus the email content) for only $20 more than the base level course! * – Freebies are delivered via email over the 30 day period of the course. 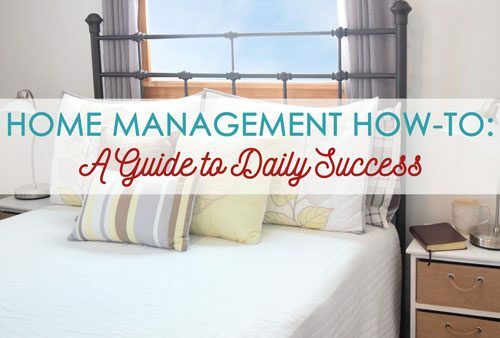 I have been a fan of Stacy’s simple safe home management strategies for a few years now. But having all these tips and helps in one place with new inspiration she’s not given before is really worth taking this course. Compared to other online course prices, the Myers certainly stuck to their frugal convictions and made this the most adorable online course I’ve seen. Thank you Stacy and Barry for the awesome content at a great price. I have definitely become a more efficient homemaker with this! I loved this course! I’ve learned so much from Stacy in all the time I’ve been following her blog and social media. This course was every bit as good! I have practical steps I can follow without being overwhelmed and certainly without being bored as I learned how from Stacy. I just wanted to thank you so VERY much for making the AMAZING course. I have finished all the videos and have slowly been working through the resources and it has not only inspired me to get back to cleaning and keeping an orderly home but it was just so darn fun to watch you. I love your humorous approach to keeping your home in working order and it makes an otherwise dull topic completely approachable. I was never taught to keep a home growing up so this has been so helpful! I love the daily task idea to break things up and establish a lasting routine. Thank you again!!!! I LOVE all of what Stacy teaches us – and this is no exception! I especially appreciated that she addressed ways to help for those that work full-time or outside of the home. Very down to earth and do-able – thanks, Stacy! Wonderful program to help anyone get back on track and take control of their life. A lot of times we try to keep up with everyone else. One thing that stood out was this is a program for any family and just be who you are. Thanks Stacy!!!! Simple, fun, and easy to follow! What a great course. Worth every penny! I have done many courses and read many books. I knew a lot of the info that Stacy presented just could not figure our how to implement and make it work. Stacy takes homemaking concepts and organizes them into easy to implement chunks. By the end of the course you will have a system and routine set up that will really work for you! !